Opencart Marketplace USPS By Stamps.com facilitates to provide cost-effective and efficient shipping services. This shipping integrates Stamps.com, offering first-class Domestic and International Services. The shipping cost will be calculated based on the weight of the product and the zip code of the seller and the buyer. The major area of concern for any online store owner is to provide excellent customer service. This includes delivering products to its customers on time. With the help of our Marketplace USPS by Stamp.com module, both the seller’s and the admin’s products can be shipped with the help of USPS shipping services. This requires the store owner to use eminent shipping services to deliver the owner’s and vendor’s products. USPS or United States Postal Service is a shipping service provider for Domestic or International shipping. Note: – In order to use this add-on, the admin should install Opencart Marketplace module first. 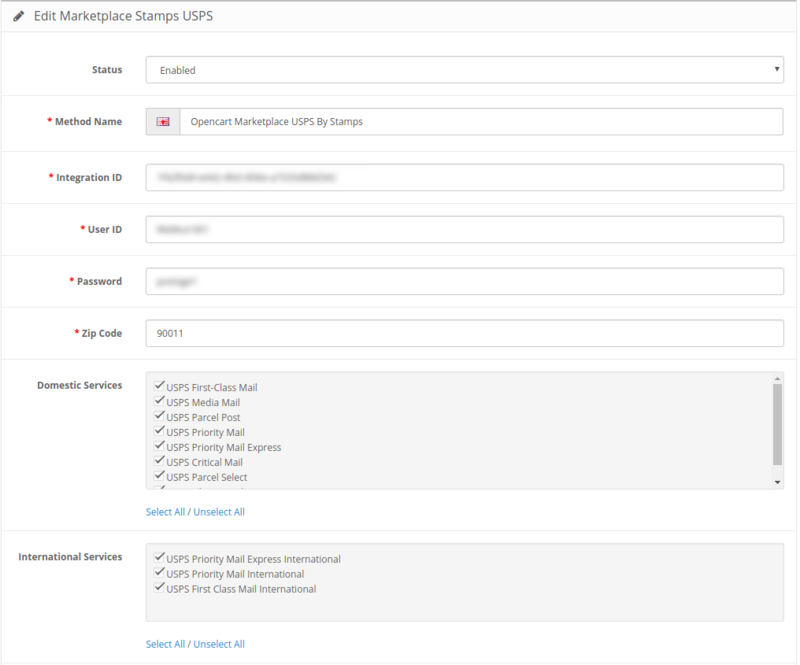 A title is allocated to the shipping method which appears during checkout. Provide USPS shipping for the vendor’s products. Enable or disable the product weight to be displayed on the checkout page. To install this marketplace add-on please follow each and every step carefully. After downloading the zip file, extract its contents to your computer and then select the opencart product version folder. Now select your specified product version folder, then you need to copy admin, catalog and system folders into the opencart root folder directory as shown in below screenshot. 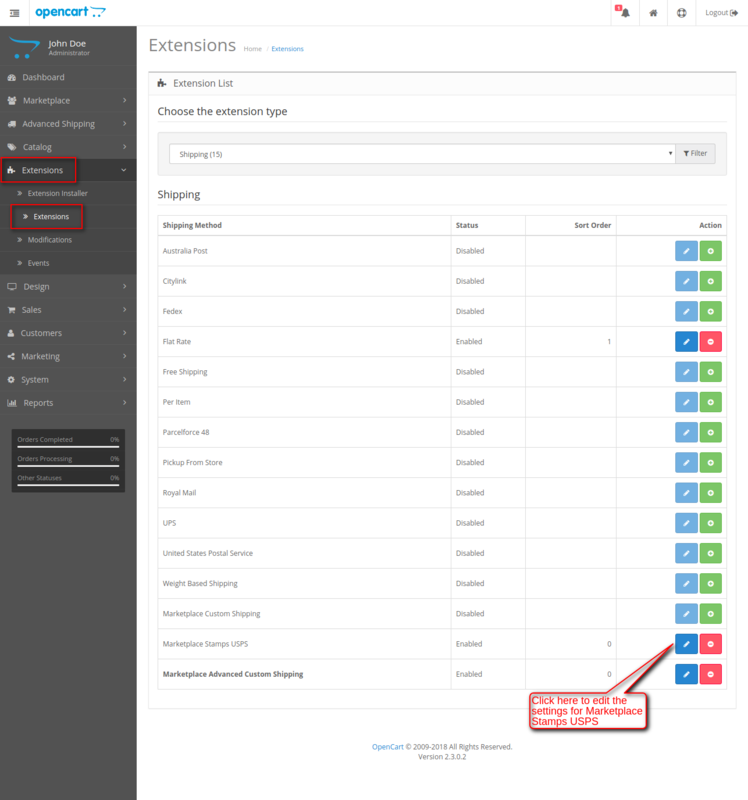 After uploading folders, log in to the Admin account in opencart and click Extensions menu option as shown below. 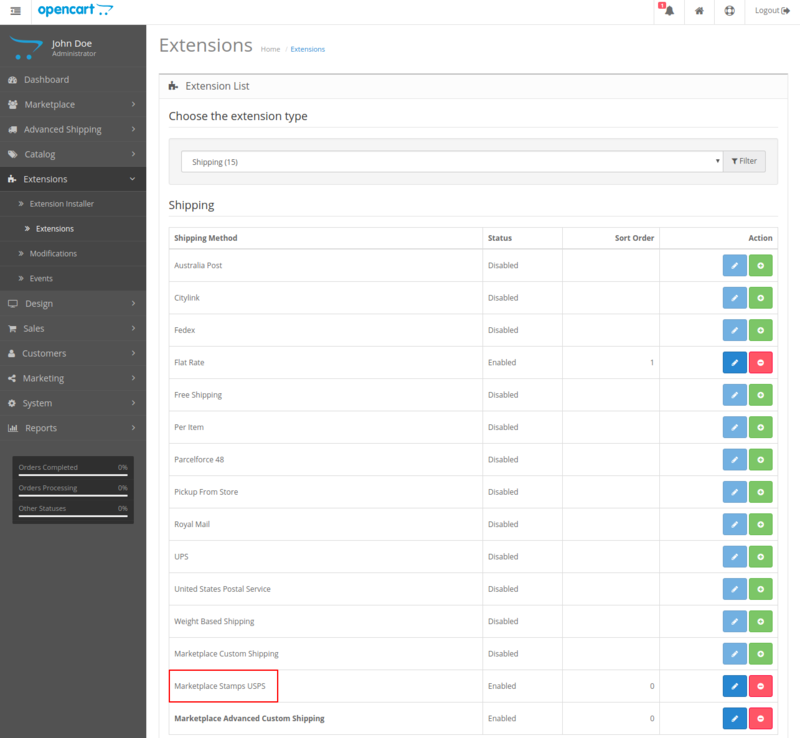 This is the Extensions settings page here you can find all list of opencart extensions. Here you have to go to the drop-down menu and select Shipping option as shown in below screenshot. After selecting Shipping menu option, a new page will appear where you will find all the list of shipping extensions, you will find Marketplace Stamps USPS extension in the list click the Install button as shown in below screenshot. 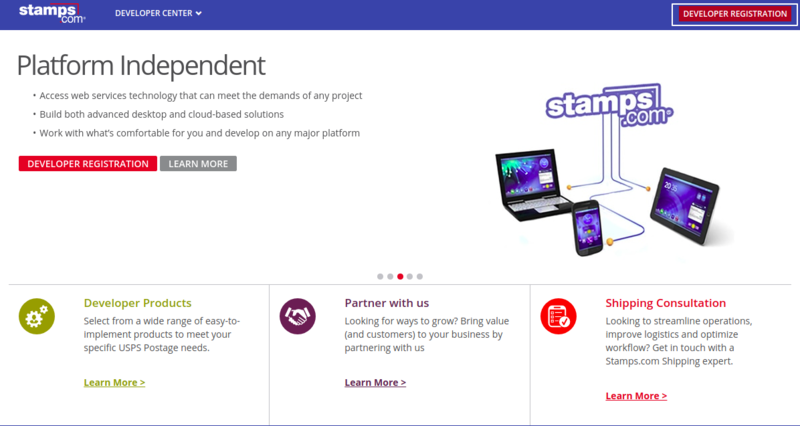 The user will have to create an account with Stamps.com in order to access their services. The user can hit the link- https://developer.stamps.com/developer/ and proceed to register. 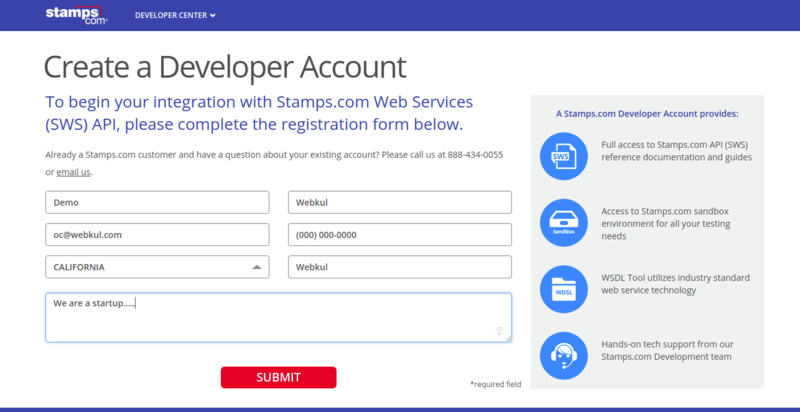 The user will have to click on the Developer Registration button on the stamps.com homepage. On clicking the Developer Registration tab, the user will be redirected to the Create a Developer Account page as shown in the image below. The user will have to fill in the required fields in the Create a Developer Account page and submit the details. The user will be redirected to the License Agreement page. Once the user clicks on the “I Agree” tab, the user will be registered to Stamps.com. The user can then ask the API credentials by sending an email to the Stamps.com. The demo email format is shown in the image below. The user will receive an email to provide the details such as Name, Company Name, Address, Email etc, from Stamps.com. A demo email of a revert mail from Stamps.com is shown in the image below. On providing the details which Stamps.com requires, the user will receive a mail which includes the Integration ID, Username and Password etc. A demo email which displays the details user requires is shown in the image below. Hence, by following these steps, the user can register themselves to Stamps.com and acquire the credentials from the same. 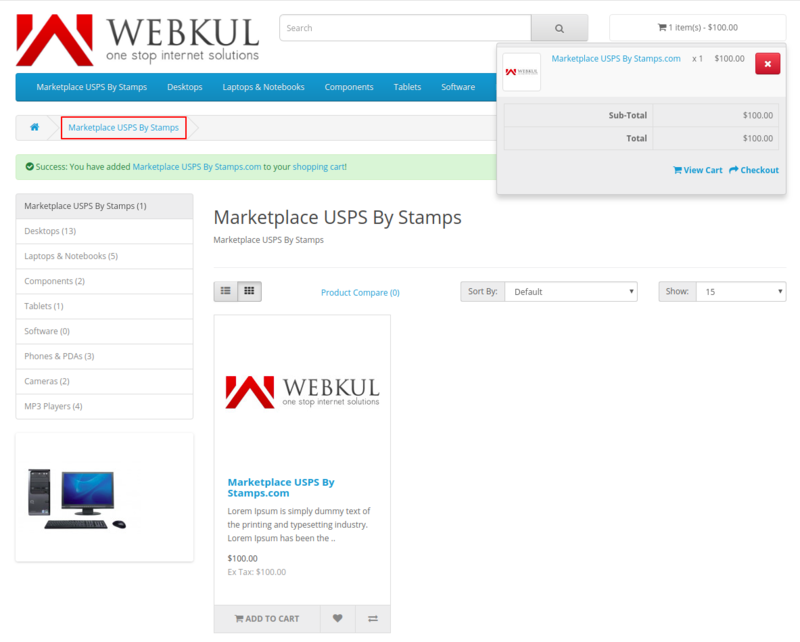 After successfully installing Marketplace USPS Shipping by Stamps.com, the admin can view the Marketplace Stamps USPS tab after navigating through the Extension > Extensions > Modules as shown in the image. On Clicking the Edit button, the admin can configure the settings for the Marketplace Stamps USPS. Status: The admin can set the status of Marketplace USPS shipping as ‘Enabled’ or ‘Disabled’. Method Name: The title for the shipping which appears during checkout to the customers. Integration ID: The integration id is configured through Stamps.com. User ID: The admin has to enter the USPS User ID. The user id is configured through Stamps.com. Password: The password is configured through Stamps.com. Zip Code: It is the admin’s store area zip code. Domestic Services: Admin can select the given USPS domestic services, which are visible at the frontend to the customers during the checkout process. Package Type: Admin can select the package type from the list. Dimensions: The admin sets the minimum required dimensions for the package type. Weight Class: Select Pounds or Ounce against the Weight Class for USPS shipping. Tax Class – Select a tax class from the list for this shipping method. Geo Zone – Select a geographic zone from the list for this shipping method. Sort Order: The order in which the shipping will be displayed in the frontend. Delivery Days: The admin can set the number of days which will be added to the delivery date estimated by the USPS shipping service provider. Debug Mode – Set this to Enabled to print request and response in logs. 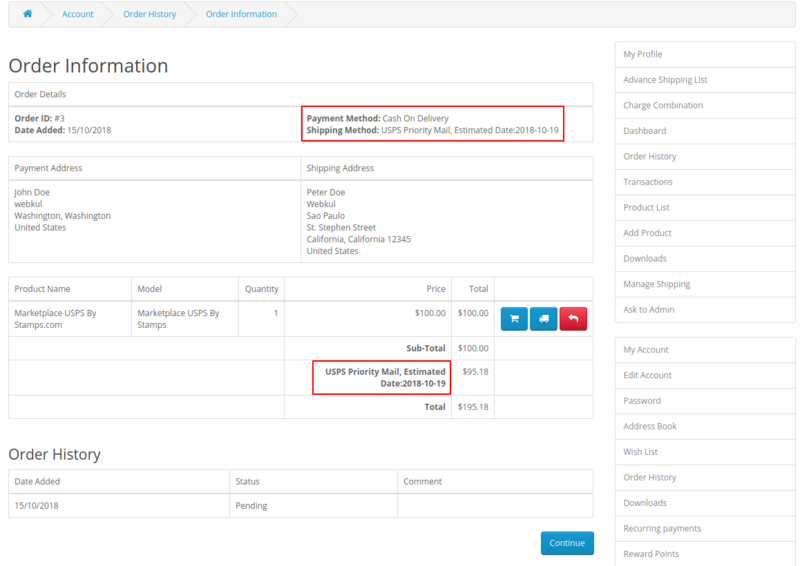 After Saving the settings, Marketplace USPS shipping method will appear during the checkout process on the frontend. The user can log in to the frontend dashboard and make a purchase under Marketplace USPS By Stamps. The user can choose an admin/seller’s product and add it to the cart. On adding the products to the cart, the user can view the cart and proceed to checkout. On filling in the delivery details, the domestic or international shipping options, which the admin configures will be available under the Delivery Method tab. The shipping options will be available on the basis of the delivery address. If the delivery address of the customer is of United States, then the Domestic Shipping option will display. If the customer is from anywhere other than the United States then, International Shipping options will display under the Delivery Method. In the image given above, the user adds an address which falls out of the US zone. Therefore, the international shipping options will display during the checkout process. After selecting the shipping method, the user can choose a payment method and proceed to confirm the order. Under Confirm Order, the user can see the USPS shipping service’s name and its price as shown in the image below. On the admin end, the order will be displayed as shown in the image below. The types of USPS shipping- International as well as Domestic are described below. The International will apply when the delivery address falls out of the US zone. The shipping options which the admin configures for International Shipping will display during checkout. 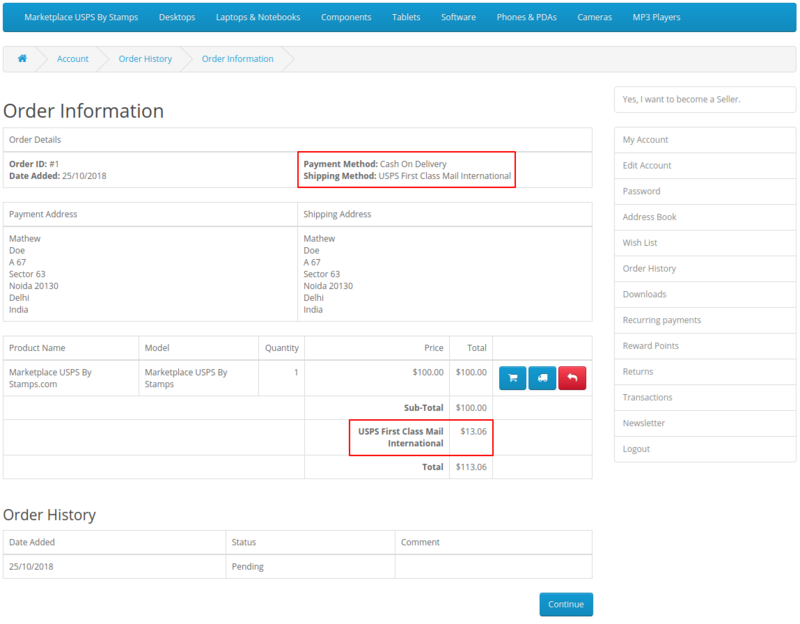 On filling the billing address and the delivery address details on the checkout page, the International Shipping options will display under the Delivery Method tab as shown in the image below. The user will have to select a shipping from the given options proceed to confirm the order by choosing a payment method under the Payment Method tab. Users can see the name of USPS shipping service and its respective price as shown in the image below. After placing the order, the user can view the order details in the Order History page. The user can click on the View button against the order. On clicking the View button, the user can view complete order details of the order which the user places. The user can make a purchase within the US zone for which the Domestic shipping options will display on the checkout page. Once the product is added to cart, the user can view the details of the order and proceed to checkout. In the checkout page, the user will have to fill in the billing and the delivery details as shown in the image below. In the delivery details section, the user fills in the address which falls in the US zone. 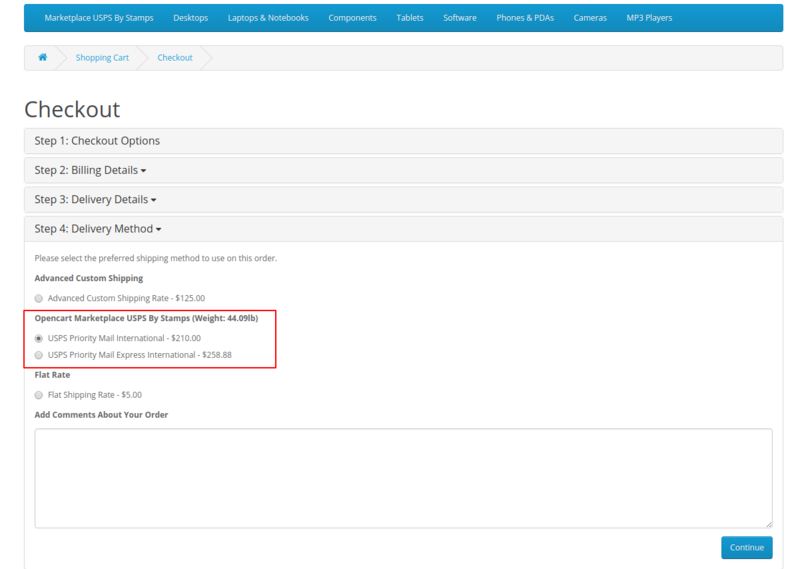 Once the delivery address details are set by the user, the options for Domestic shipping are available on the checkout page as shown in the image below. After selecting the Domestic shipping option, the user can proceed to confirm the order. Under the Confirm Order tab, the shipping chosen by the user will display as shown in the image. The user can confirm the order by clicking on the Confirm Order button. 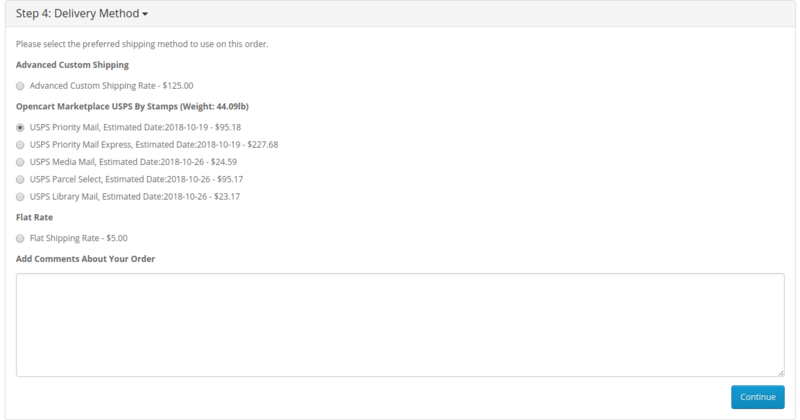 After placing the order, the order will be listed in the Order History tab of the seller dashboard as shown in the image below. The Seller can select any order and can click on the View button. After the View button is clicked, the seller can see the order details with the respective shipping as shown in the image below. On clicking the View button, the user can view complete order details of the order which the user places for the US zone. That’s all for Opencart Marketplace USPS By Stamps.com. For any query or doubt, please add a ticket at https://webkul.uvdesk.com/.